Colette gave herself to prayer and penance, and like St Francis, had a deep devotion to Christ's passion as well a love and care for animals. Colette sought a radically austere life after the example of St Francis and St Clare. 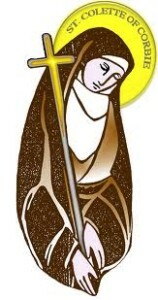 She became the one who restored the Poor Clares to the original Rule of St Clare. At the heart of that Rule is radical poverty: even the community does not own anything. Patrick Duffy tells her story. Colette was born in Corbie in Picardy, France, where her father Robert was a carpenter at the Benedictine abbey. As both her father and mother were advanced when their first and only daughter was born, they called her Nicolette in honour of St Nicholas (6 Dec), to whose intercession they attributed her birth. Colette received a primary education and then lived at home almost as a solitary, praying, doing manual work and teaching catechism. By the time she was 17, both her parents had died, leaving her in the care of the abbot of Corbie. Unsure of what she should do, Colette first tried a group of Béguines who served the local hospital, then a community of Urbanist Poor Clares (observing the Rule of St Clare as revised by Urban IV) and lastly the Benedictines. But none of these was strict enough for her. A Franciscan priest advised her to join the Franciscan Third Order and take up the life of a recluse, like Julian of Norwich (1342-1416). So at 22 she became enclosed in a room attached to a church for two years. Two faithful friends saw to her needs, while she gave herself to prayer and penance, looked after the church linen and mended the clothes of the poor. Many visitors were attracted to her because of her reputation for holiness. She communicated with them through a grille. At times she was in joy and at times in desolation. One day she had a vision of St Francis prostrate at the feet of Christ begging Colette be given for the reform of the nuns and friars of his order. This seemed to her a great temptation, but eventually when she saw it was the right thing to do, she consented. The first house she was able to reform was that of Besançon, but others, especially in Picardy and Savoy, strongly opposed her. She founded seventeen other houses of strict observance in France and Belgium. 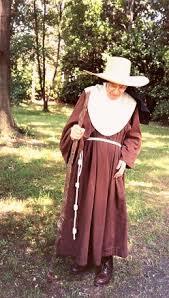 She also communicated with others in Italy who were working for the reform of the Franciscans, such as St Bernardine and St John of Capistrano. The followers of the Poor Clares which she reformed are known as the Colettines, as distinct from the Urbanists (see above). Colette, like St Francis, had a deep devotion to Christ’s passion as well a love and care for animals.